A proposal that could require large commercial and residential properties in the county to have fewer parking spaces in an effort to force greater use of public transportation and get cars off the road is being questioned by business groups. County Executive Marc Elrich is pressing for updated regulations that would require building owners countywide to have a “traffic mitigation plan” designed to get more people onto public transit or carpools by cutting the number of parking spaces for commuters. At present, five areas in the county – Bethesda, North Bethesda, Friendship Heights, Silver Spring and Shady Grove – require businesses with 25 or more employees to have the plans, which also mandate designated parking spots for carpoolers and van services. 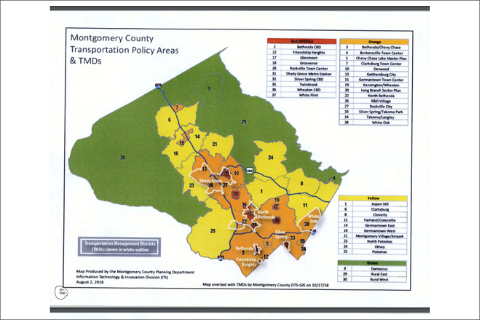 Each of the areas also sets a goal for the number of employees not driving to work, which ranges between 18 percent in Shady Grove to 46 percent for Silver Spring. 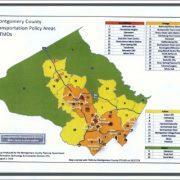 The County Council’s transportation and environment committee last week began reviewing the proposal, with council members agreeing more study and public input is needed. The Montgomery County Chamber of Commerce is among the groups opposing the change that it says puts additional restrictions on developers and owners. Stacy Silber, a board member of the regional chapter of the Commercial Real Estate Development Association, wrote to the council in December, saying the change could stifle economic growth. “On an economic level, as one example of the potential unintended consequences, this Bill would enable the Director to regulate commercial lease negotiations and limit a property owner’s potential revenues from parking by prohibiting the bundling of parking spaces that the property owner constructs in compliance with County Code,” Silber wrote. Nicola Whiteman, a senior vice president with the Apartment and Office Building Association of Metropolitan Washington, said she was worried about new multi-family developments that previously hadn’t needed to comply with the parking requirements. Having transit nearby, she said, isn’t always sufficient. “You may have a situation where you may have the bus, and they’re doing what they can [to comply with commuting standards] but they might not be able to do more,” she said of some properties. Whiteman said her organization’s members own more than 20 million square feet of commercial office space and more than 60,000 multi-family apartment units. While transportation alternatives are important, she said lawmakers must evaluate how realistic raising the commuting goals are in the county. “Where people can, they’re providing alternatives, but it’s a balance … but we also have residential communities where they’re not working around traditional Metro hours, and they need a car,” she said. Council member Tom Hucker said that he worries crafting stricter parking standards, while noble, doesn’t accomplish the larger goal of increasing public transit available to some areas, such as parts of his district that include the eastern county. “Built into this is the assumption that everyone has good transit options…there’s nothing wrong with this but it doesn’t put any more buses on the street, it doesn’t make metro go where it doesn’t go,” he said. The plan the council is considering was formulated by former County Executive Isiah Leggett and has been amended by Elrich, whose changes mandate that each building with a transportation management plan “demonstrate progress” toward its commuting goal, or the county’s Department of Transportation would then have the authority to limit parking availability for use by employees commuting during peak periods. Chris Conklin, the deputy director for the Department of Transportation, said when Elrich took office in December, he expressed a desire to prioritize getting cars off the road. “He felt that some of the limits were too lenient, and asked us to consider that the targets be achieved,” Conklin said. A separate component of the bill that would levy additional fees on all existing non-multi-family residential and commercial development was recommended by council staff. Council member Andrew Friedson, who is not on the committee but represents an area that includes Bethesda’s central business district, wrote in a memo that he was “alarmed” by the recommendation.